My sweet angel, it has been WAY too long since I wrote directly to you. Part of me hasn't realized how quickly time is going and another part of me tries to pretend that I will always remember every cute thing you do, which obviously is not the case! I've said it since you were born, but you truly are an amazing little girl - full of life and excited to learn and explore the world. This month you will be 21 months old. Some of your favorite things include reading books, playing with your baby dolls, watching Mickie Mouse Clubhouse, playing with play dough, and spending time with family. We are slowly building your collection of books, with which you are so careful and spend hours flipping through each of them. We also started going to the library, which continues to be an adventure - you love to hang on the handrail by the windows like a monkey. During these winter months, both of us are struggling with being indoors all day. We both get a little stir crazy. You love looking out the windows while we drive and I can't wait for you to be able to play outside everyday. 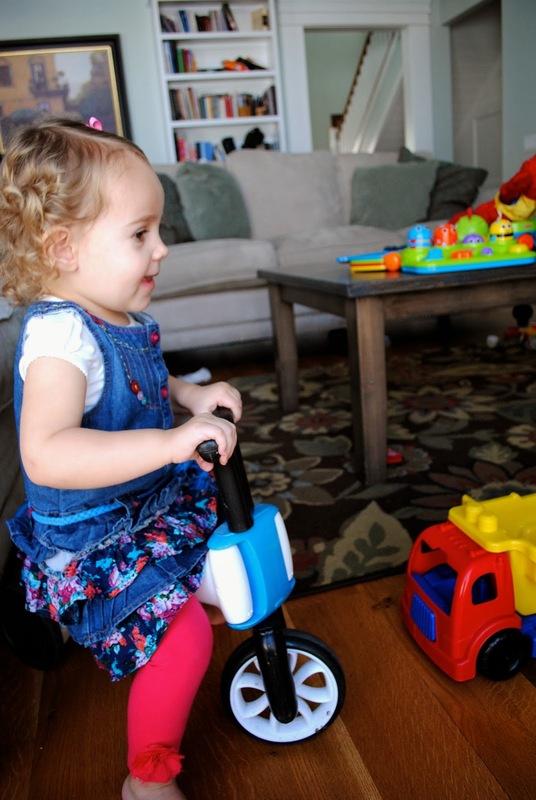 You received a tricycle for Christmas and will love riding it all summer. Recently you started going to Nursery at church, and it's been a struggle. Even though you are a social butterfly - literally saying hi to everyone - you aren't too sure about being away from mom and dad. We decided to get you involved with more social situations that involve some of your friends, so we started setting up playdates and going to Kindermusik class. You LOVE Kindermusik! You listen incredibly well to the teacher, follow instructions, and help clean up the toys. Your love of music definitely comes from daddy and many nights the two of you sit at the kitchen table and drum away. On top of all that, you are developing quite the vocabulary. You can say just about anything when asked to repeat, you can say your name and say how old you are, and you can sing a few songs. This past week you started putting multiple words together and will say "help mommy" or "one more time" and have been asking "what's that?" constantly! You love to sing The Wheels on the Bus and If Your Happy and You Know Out. We are starting to get really creative with these songs. And finally, you are incredibly coordinated and fast - it'll be fun to get you playing sports with dad this summer. As always, I feel lucky to be your momma and to spend my days with you. Your smile is infectious and your laugh is the sweetest sound. Today you told me that I was your buddy, and although you may not always see me as your "buddy", I hope that you will always remember that I love you more than anything in this world! Your constant hugs, kisses, and hand holding are something I will cherish forever and maybe, if I'm lucky, you'll always let me snuggle you. Love you baby girl!